Athena School of Arms – Swords are Fun! 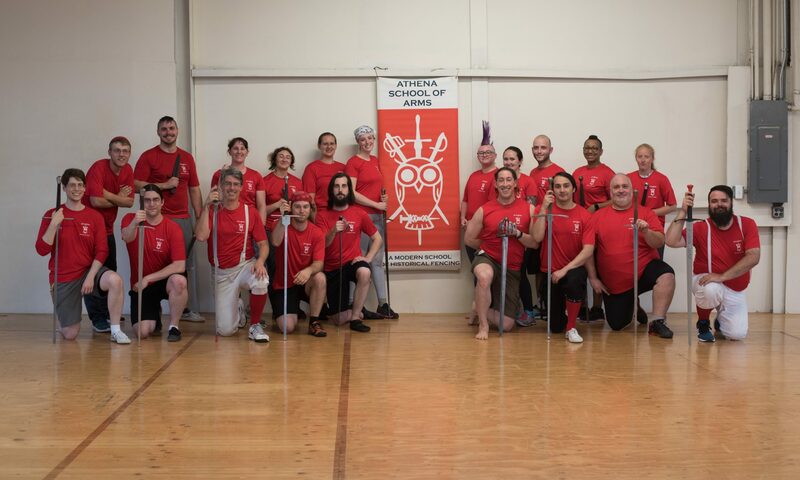 Athena School of Arms is a non-profit Historical European Martial Arts (HEMA) school, an affiliate of the Historical European Martial Arts Alliance, and an active member of the New England Sword Gathering. Operating out of Cambridge, MA, Athena School of Arms promotes the study of HEMA and physical fitness by providing individual training and public demonstrations. 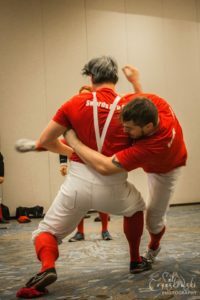 By sharing the historical context and martial principles found in HEMA in a safe and open environment, we can help others gain an appreciation for our art and become more physically fit in the process. Fight masters from the 14th-16th century wrote treatises that described how to fight with a variety of medieval weapons. We use these manuals to recreate ancient fighting styles. While we primarily study the German Longsword as described by Johannes Lichtenauer, we also work to reconstruct the Highland Broadsword, Dagger, Sword & Buckler, Poleaxe, Ringen (medieval wrestling), and Victorian-era weapon systems. We have a diverse membership, including people who love history, people do HEMA because it’s more fun than using a treadmill, and serious competitors who take home prizes from regional tournaments. We pride ourselves in offering an open, welcoming environment. Come check us out! Nathan Weston is President of the Athena Board of Directors and Senior Instructor at Athena School of Arms. Nathan studied a variety of martial arts, as well as Olympic sport fencing, before taking up HEMA in 2012. 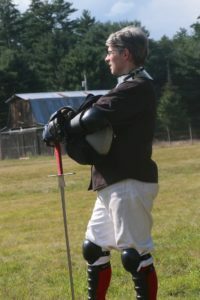 He teaches Longsword, Broadsword, and Italian Rapier. He is also one of the event organizers of Iron Gate Exhibition, the largest HEMA Tournament in the Northeast. 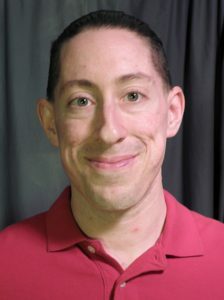 Andrew Kilgore is Treasurer of the Athena Board of Directors and Senior Instructor at Athena School of Arms. Andrew has studied a wide range of eastern martial arts for over 20 years. In 2012, he began focusing on HEMA when he started studying German Longsword with Steven Hirsch. An accomplished tournament champion, Andrew focuses on the core principles of whatever system he studies to help deepen his and his students’ understanding of the art and how to use it in martial contexts. With over a decade of experience working with youth and teaching people of all ages, Andrew brings his love of martial arts and passion for helping others to the floor at Athena School of Arms, where he teaches Longsword, Ringen, and Dagger. Julie Olson is Clerk of the Athena Board of Directors and Senior Instructor at Athena School of Arms. Julie has nearly 20 years of Olympic sport fencing experience. 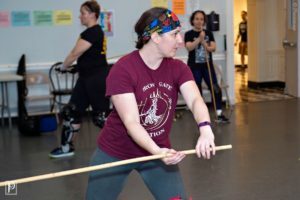 In 2013, she was introduced to HEMA by watching a demonstration given by Athena at a local sci-fi/fantasy convention, and it wasn’t too long before she began studying German Longsword full time. Julie has a passion for sword fighting, physical fitness, and encouraging people of all ages and walks of life to try HEMA. Julie teaches Longsword, Italian Baton, and Italian Dueling Sabre. Julie is also Manager of the New England Sword Gathering, a league for Northeast HEMA clubs; and Event Director of Iron Gate Exhibition, the largest HEMA Tournament in the Northeast. Steven Hirsch is the Founder of Athena School of Arms, Club Physical Therapist, and an Instructor of the Small Sword program. Steven has a doctorate in Physical Therapy and a B.S. in Exercise & Health Science, and is an NSCA Certified Strength & Conditioning Specialist. He has been training with swords since 2006 and unarmed martial arts since 1998, first with the Higgins Armory Museum and now teaching at his own school, Athena School of Arms. Steven is also a professional strength coach focusing on performance for combat sports and martial artists, and runs his business Fight with All Your Strength. Athena School of arms is a 501(c)(3) non-profit corporation organized exclusively for education and charitable purposes.